Little White Couture Bridal Accessories have a wide collection of wedding jewellery and accessories, and with so many products to choose from how do you choose what is right for you? Because buying online is a little different to buying in store, you can’t touch feel or try. Accessorising for weddings is a little bit different to the everyday….Why? Because everything is a little larger than life on your wedding day! You will be wearing more makeup, your hair will be “done”, you will have your photo taken a lot, and people will be viewing you from a distance. You’re also wearing a big white dress! With all of this in mind, the jewellery you wear on your wedding day will often look smaller and more subtle than you originally envisaged. What looks big and bold against your everyday clothing will look a lot more subtle next to a wedding gown. So we have compiled the following tips and advice to assist you in making the best choices when buying your wedding jewellery and accessories online. One of the most important things to consider when buying bridal jewellery online is the SIZE. Earrings and bracelets are made in a variety of proportions and sizes and it is important you know that the size you are buying is right. Ensure you check the sizing given or contact us if you need more information. Most Necklaces will be a one size fits all but you should consider first other elements, such as your wedding dress as primary factor in selecting the perfect necklace to best complement the gown’s neckline, or the lack thereof. Plunging Neckline dresses, go for a necklace that has an adjustable chain to allow for perfectly positioning the focal piece. Detailed Ornate or High Neckline dresses, we suggest finding a simple low impact necklace or just go for a statement pair of earrings. It is important to check the size of the earrings you are buying as you want to make sure your proportions are right with all your other accessories. Test if the size suits you with something similar you own, or simply take a ruler and measure the length next to your face from the lobe. You will then see exactly where the bridal earring will land against your bone structure. 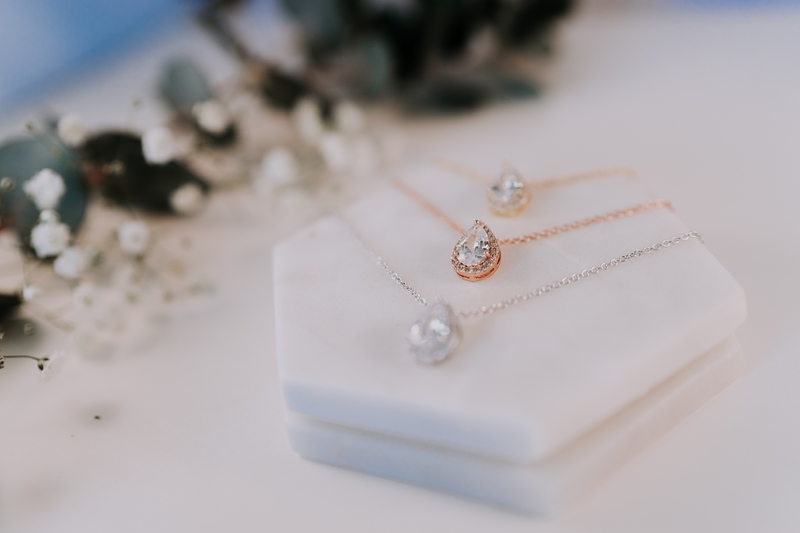 You should definitely consider going bolder with your choices (even just slightly) when it comes to choosing the size of your wedding jewellery and accessories if you want them to hold their own in your wedding day look. This is especially true for earrings! Very tiny or overly modest bridal earrings will be practically invisible from a distance and even less visible in your wedding photos. Our gorgeous range of bridal bracelets are offered in 2 different size options, either 17cm or 19cm. Most of our bracelets are designed to be slightly floppy and comfortable when worn, very few are designed to fit super-tight onto your wrist. Bear in mind that every bracelet will have some degree of “give” in it. This is normal! To check how the bracelet might look take a measuring tape or piece of string and measure the circumference of your wrist to determine how well the bridal bracelet or special occasion bracelet will fit you. When buying wedding jewellery online, whether it be bridal earrings, a bridal bracelet or wedding hair accessory, we understand the need to get it right! Please read carefully the detailed description and measurements for each listing. We also make suggestions on items to match it with to make it easier for you to co-ordinate perfectly. Most importantly Don’t leave choosing your accessories until the last minute. Having your accessories at your hair trial and dress fittings will really help pulling your wedding day look together. Be open minded about your wedding accessories as it is the one day that you can make bolder choices. As long as what you choose reflects your personal style and personality, you won’t go wrong. We hope this information has been useful in helping you to choose wedding jewellery and accessories from us. Click here to get started shopping our earrings, bracelets, hair accessories and necklaces! Feel free to email us for assistance in pairing pieces, we love helping our gorgeous brides to be with their accessories choice and sometimes you need a second opinion when there is so much to choose from.